Kopanito All Stars Soccer is an Action and Sports game for PC published by Merixgames in 2016. Control a soccer team in an unreal world. This is a fast-paced soccer game which is fully based on your skills. It means that you have to train more than your opponents to reach goals on the field. It’s a bit different than the real world’s soccer! You can do lots of super moves to crush the opponents. Actually, You will experience a battle during a match. When you play well on the field, You get a power-up such as a super-strong magnet, a big windmaker or a super-shot. You will learn how to use these super-moves at first. But the game isn’t just using this type of rare movements. 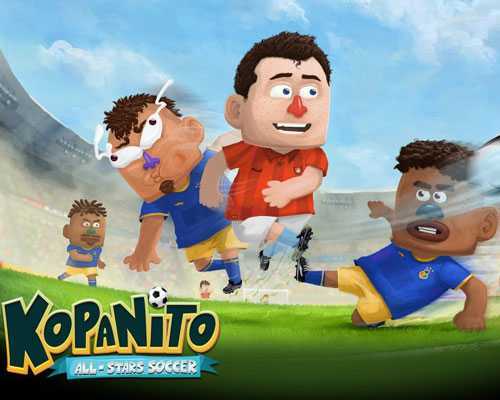 You need to control the ball more than your opponent in Kopanito All Stars Soccer. The team wins which scores more goals than the other team. Your players may get injured in the matches. You have to change them so fast to confirm a new tactic. There are four types of game modes to experience Kopanito All Stars Soccer; Duel (1 vs 1), Doubles (2 vs 2), Chaos (3 vs 3), Complete (5 vs 5). The players can also play this game in local with friends. If you got bored of playing matches, The challenges are ready for you! They’re really amazing. There are some tools to spend your time in Kopanito All Stars Soccer like GIF generator. You can use this tool to make GIF pictures in the game. There is also a replay system that you can repeat the previous scenes by using that. 6 Comments ON " Kopanito All Stars Soccer Free Download "
Can you do dark souls? It tells to open the file “player1.gz”, i went to check it on the game folder and it wont open. I cant open this game fuckkkkk!!! whyyyy this game is eroorrrrr!! It tells to open the file “player1.gz”, fuckkkkkkkk!! !